Director of the Wilmington Academy of Art and the Delaware Art Center, Edith Howard was also a member of the Philadelphia Ten, a group of women who exhibited together. 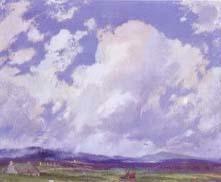 She studied at the Philadelphia School of Design for Women and with Elliott Daingerfield and Henry Snell. Affiliations included the American Watercolor Society and the National Association of Women Artists. She was also active in New York City where she taught at the Grand Central Galleries and School of Art.